For today’s home tour, we're visiting the bustling Brazilian city of Sao Paulo, and a dwelling located in the green and breezy outskirts. Built by Studio Vettori Architecture on a simple plot, this house is warm, peaceful and functional, with lovely gardens perfect for soaking up sun and relaxing with family or friends. One look at this abode and we could almost feel the leisurely glow exuded from within! The feeling was so therapeutic, we decided to swoop in on the house for a tour… Join us and get inspired! The designers have opted for a sleek and modern façade, replete with gentle geometric patterns for the porch. The driveway comes to a halt under the rectangular lot that houses the garage, while the main porch is a semi-circular affair in ceramic tiles of white and grey. 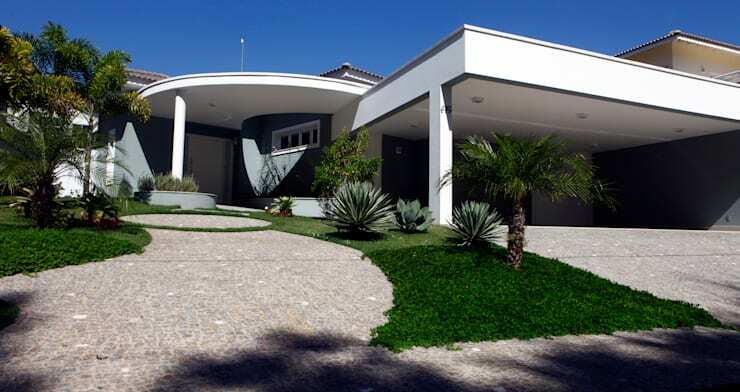 The curved pathway leading up to the main door gives a soft and warm look to the façade. The living room was perfected with bold accents and subtle textures like the porcelain floor. 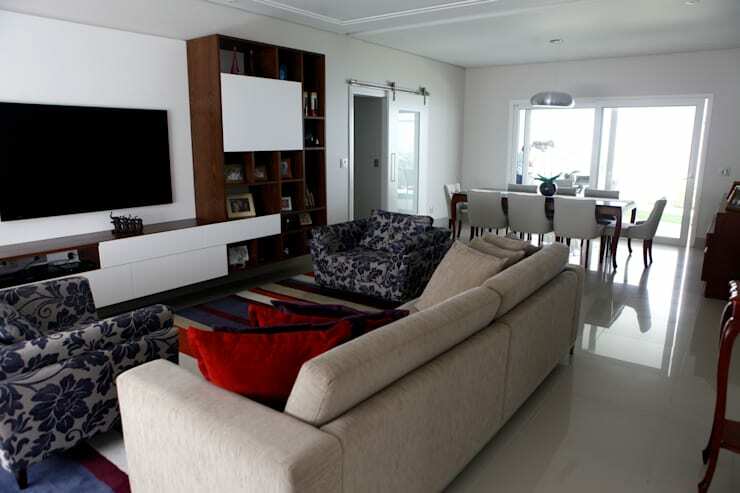 The functionality of the area comes through with the placement of the television and stylishly understated couches. A bookshelf houses decorative items and family pictures, imparting some unique charm. 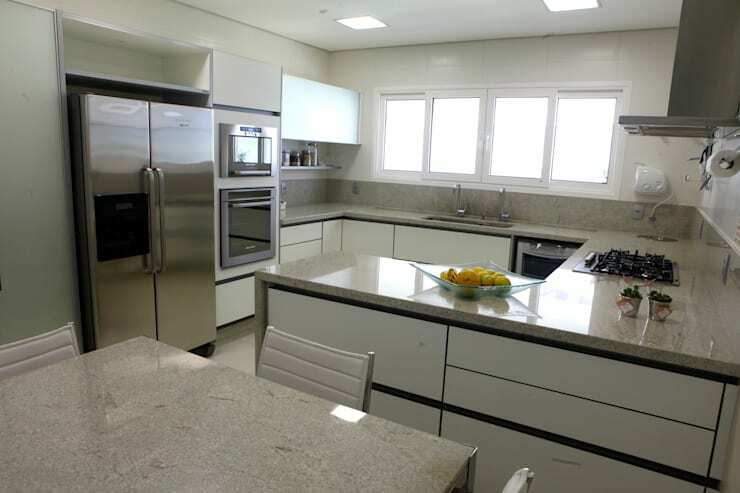 The kitchen has been finished with glossy cabinetry in white, while chrome appliances shine life into the space. A stone-textured table sits out front with leather upholstered chairs around it. Accents of black run along the white surfaces for some monochrome magic. A bank of windows on one side lets fresh and natural light enter this zone. The cosy bedroom is adorned with rich jewel hues and looks seriously inviting. The green bedding with purple accents livens up the grey wainscoting, while the wide panel of white runs along the periphery to create a balance of sorts. Lamps and wooden flooring complete the look. The bathroom features delicate detailing which perfectly complements solid granite fixtures like the counter. 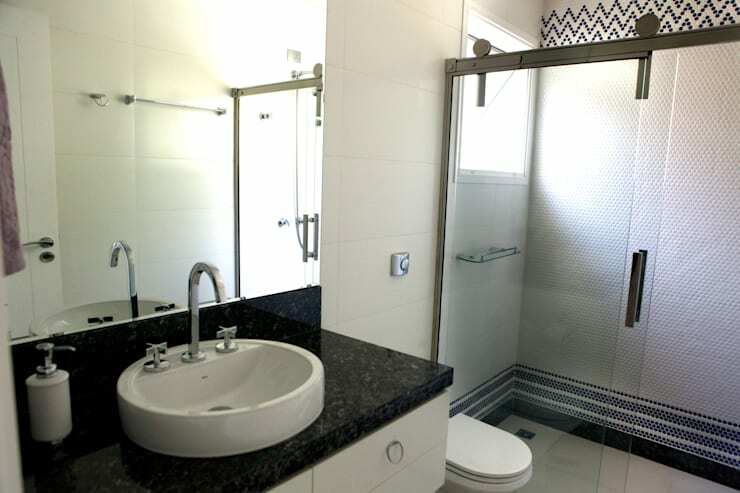 The shower area in particular takes the cake with its blue patterned tiles, imparting a delicate touch to the entire area and breaking up the monochrome monopoly. 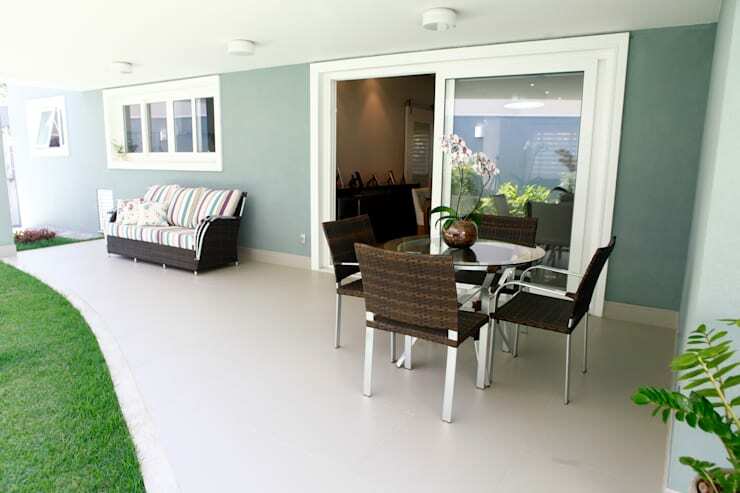 We love this beautiful terrace with its sparkling white floor and manicured lawns. This area also makes for a great outdoor social hub, with stylish wicker dinner chairs and a striped rattan couch where one can enjoy a good book. The large glass sliding door allow a great connect between the indoors and outdoors. This is truly a great space for enjoying an outdoor lunch or entertaining guests! And finally, we arrive at the lovely little garden behind the house. The rear side of this home has been designed along the lines of a modern-day cottage, with solid grey walls providing the perfect backdrop for vegetation. 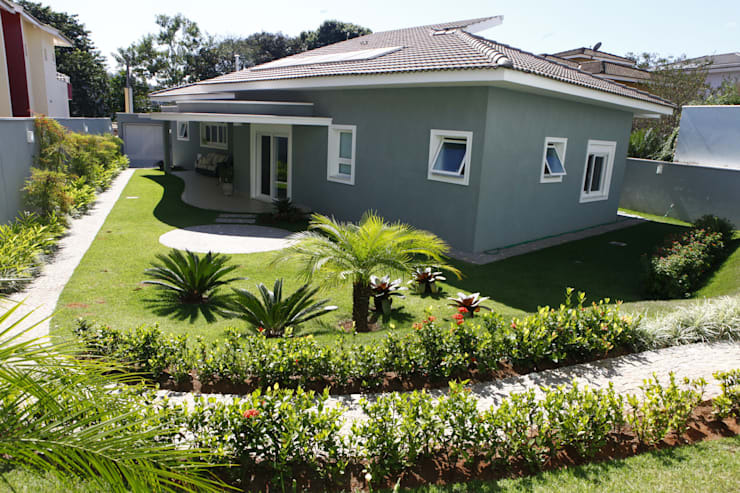 The greenery envelopes the home from all sides and provides much natural relief. Overall, this is a lovely space for children to play and a family to enjoy! Inspired by this home tour? Here's another that is sure to interest you: Ready in 45 days, this 65m² prefab house has space for everything! Can you see yourself in a home like this?